Many of you will instinctively say yes; to keep users engaged with your content and to stop them from navigating away from your site. But before you tick that box, make sure you really know what the consequences could be for users of all abilities. Google experts are notoriously close-mouthed on the secrets behind SEO success. One thing they have confirmed, however, is the importance of associating your website with other good-quality, credible and relevant sources of information on the web. Linking your web pages or blog posts to external pages on high-authority sites shows search engines that you know how to find top quality content – thus associating your own site with that quality content. Sometimes it seems counter-intuitive; digital marketing gurus talk a lot about “bounce rates” – a metric that measures how long visitors stay on your site, and it’s true that including links to external sites could result in visitors “bouncing” off your site to go elsewhere. Google says it’s worth taking that risk, as long as you have confidence in the quality of your own content. Ideally you should be able to keep visitors reading one of your blog posts or articles right to the end, before they choose to follow that other link for supplementary information. So we’re all agreed that connecting your site to external high-quality content is a good thing, and one that could help boost your overall SEO – but the manner in which you make that connection is still very much up for debate. Internal linking is easy: you need to provide your users with a coherent map with which to navigate your own content, so opening links in the same window is intuitive for both web editors and users. To have internal content open up in a new tab would be surprising and probably unwelcome to the average user. The debate heats up when it’s time to decide how to treat external links. As you insert a hyperlink within your copy, you’ll often be faced with a choice: “Open link in new window?” Traditional guidance has always delivered a firm no to this question – for various reasons like user experience and accessibility, which states that all websites must be accessible for users of all abilities. Opening an external link in a new window seems like a way of encouraging users to stay with your content – they’ll know the external content is sitting happily in a new tab, waiting until they’ve finished their session with your website to be consulted. But this action does constitute a change to default browser behaviour and you may leave some users surprised and confused. “Opening links in new tabs disables the back button, making it easier for readers to forget about your page. They may still have your tab open, but they’re no longer reading your information. We all know what our tab bar starts to look like when links are opening in new tabs. It makes the bar cluttered and disorienting when trying to backtrack to past pages. Having links open in a new tab can also be annoying for readers. 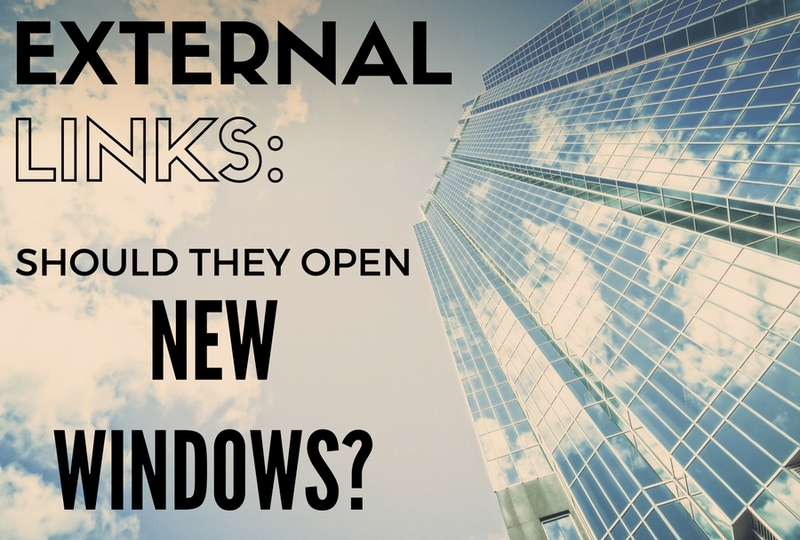 They have the option to open tabs in new windows if they choose to,” writes Meg Sutton of Curata, a content marketing forum. Many times users will click an external link in the paragraph of an article to better understand the article’s context. This doesn’t mean they want to leave your site without having finished reading the article. However, your site analytics will show a different story. If your external links open in the same tab, it’ll show that users are exiting your site quicker than they actually are. The user is logged into a secured area of a site, and following a link to a page outside of the secured area would terminate the user's logon. In this case opening external links in an external window allows the user to access such references while keeping their login active in the original window." When it comes to the practice of opening external links in new tabs, opinion remains firmly divided. While web accessibility is not the only factor behind the decisions that define a website’s user journey, current best accessibility practice relies on predictability and protects the right of the user to make their own choices. You may choose to favour bounce metrics over accessibility standards, but only do so in full knowledge that the W3C advises against it.